Although the first grapes in South Africa were planted by the Dutch in 1655 and the first wine produced in 1659, the wine industry only started to flourish in 1688 when the French Huguenots fled France after the Edict of Fontainebleau was issued, revoking the Edict of Nantes. The latter gave the French Protestants freedom of religion. The Huguenots left France with no money, but brought with them all the skills to lay a sound foundation for a future wine industry. Today South African wines compete proudly and with big success against the best wines in the world. This is mainly the result of the mild mediterranean climate with fairly cold winters and enough sunshine during the dry summer months. The climate is also influenced by two oceans – on the western side the cold Atlantic and in the south the warmer Indian. 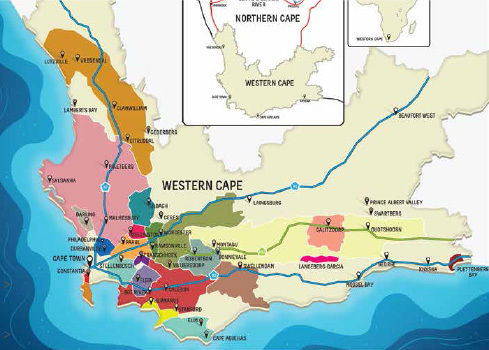 Combined with the numerous mountains and different soil types, South Africa offers the ideal micro climates and terroir for the production of outstanding wines.